Tourniquets have popularly been used in orthopedic and plastic surgeries related to the limb. Their use among clinicians is driven by the adoption of potentially efficacious blood occlusion technologies in clinical practices. The rising prevalence of severe limb injuries, fueled by the rising number of road accidents in various developing regions, is a prominent factor fortifying the demand for tourniquets. The market is also benefitting from substantial governmental spending on healthcare focusing on emergency care systems in several emerging economies and the presence of a robust healthcare in developed countries. Furthermore, constant technological advances, notably in reusable tourniquets, is expected to accentuate the overall market. Moreover, the advent of safe and highly functional systems that also offer automatic controls, even in inclement weather conditions, is expected to fuel the growth of the market. The global tourniquet market was worth US$184.6 million in 2014 and is prognosticated to reach a valuation of US$408.6 million by 2023 end. During the forecast period of 2015–2023, the global market is projected to rise at a handsome CAGR of 9.3%. The key product types comprise tourniquet system and tourniquet cuffs; the latter is further bifurcated into disposable and reusable ones. Of the two tourniquet cuffs, reusable ones have been enjoying wide popularity, attributed to their durability, use on multiple patients after disinfection, and cost-effectiveness. The segment is anticipated to expand at a CAGR of 9.1% during 2015–2023. Various concerns of infection and complications from the improper use of reusable tourniquets have gained worrying proportions in recent times. These are being addressed by constant industry efforts by framing better and clearer clinical guidelines. Meanwhile, the disposable tourniquet cuffs is expected to emerge as an attractive pace, garnering the leading CAGR of 9.9% over the assessment period. The market for tourniquet systems is estimated to reach a worth of US$240.2 million by 2023 end. Based on application, the market is segmented into arm cuffs and leg cuffs. The key end users comprise hospitals, physician/clinicians, and non-institutional. Geographically, the global tourniquet market is segmented into North America, Europe, Asia Pacific, and Rest of the World (RoW). Of all the segments, North America led the pack with a major share of 53.5% in 2014. The dominance of the regional market can be attributed to the substantial uptake in the healthcare system in treating traumatic orthopedic injuries. A massive rise in road accidents in various parts of the region in the recent years is a key factor accentuating the demand. Furthermore, relentless efforts by governments in key countries in the region to create awareness about the safe use of tourniquet systems. In addition, the advent of technologically-advanced tourniquet cuffs and their efficacy as a first-line therapy in controlling hemorrhage has also catalyzed the growth of the regional market. This is trailed by Europe and the regional market accounted for the global share of 18.4% in 2014. The presence of a robust emergency healthcare infrastructure in the region is a noteworthy factor fueling the growth. However, Asia Pacific (APAC) is likely to account for highly lucrative avenues over the forecast period. A burgeoning middle class population, coupled with the vastly rising spending capacity, is a notable factor bolstering the demand for advanced trauma care for limb surgeries. This in turn is opening up promising prospects in this regional market and is projected to rise at a CAGR of 9.9% over the forecast period. The substantially rising number of hospitals and laboratory settings is also expected to accentuate the regional market. In addition, the entry of several big medical device manufacturers in the region in recent years has created lucrative avenues. Furthermore, the adoption of modern blood occlusion technologies in traumatic centers in various emerging economies also augurs well for the regional market. Many players operate in the global market for tourniquet, making it highly competitive. In order to steal a march over their rivals in such a cutthroat landscape, companies are seen focusing on growing their product portfolio. To that end, they are coming up with tourniquet systems and cuffs having excellent functionalities. The market for tourniquet is likely to see intensifying competition on the back of launch of safer and more reliable systems, having automatic control facility. The market can be broadly segmented into tourniquet systems and cuffs. The emergence of disposable tourniquet cuffs is also serving to change the competitive dynamics in the market. With the risk of infections increasing on account of the use of reusable tourniquets, the disposable ones are seeing swift uptake. However, in certain regions the reusable ones are still preferred after proper sterilization because of their relatively cheaper price. All such product developments and their rapid uptake are making the global market for tourniquet dynamic as well. Majorly fuelling the global tourniquet market is the alarming increase in traumatic limb injuries resulting from industrial accidents, sudden accidental falls, and road accidents. They cause considerable blood loss, thereby necessitating the use of tourniquet cuff to safely thwart arterial blood flow into a portion of an extremity by exerting a uniform circumferential pressure around it at a desired point. Hospitals and emergency units are at the forefront of driving demand for tourniquets since they are first line of treatment for a host of emergency orthopedic injuries resulting from road accidents and mishaps. The increasing instances of life-threatening hemorrhage along with the emergence of state-of-the-art traumatic centers, particularly in developing economies of China, India, and Philippines, is also expected to catalyze growth in the tourniquet market in the next couple of years. In addition, emergence of technologically superior systems that can conduct blood occlusion even in harsh weather, is also predicted to spell opportunity for the market for tourniquet in the near future. A roadblock to the market growth, on the flipside, is the lack of knowledge about the use of tourniquets. However, on account of increasing allocations on healthcare in both developed and developing nations and proliferation of trauma centers with superior blood occlusion technologies, the demand in the market will likely remain supported in the near future despite such challenges. 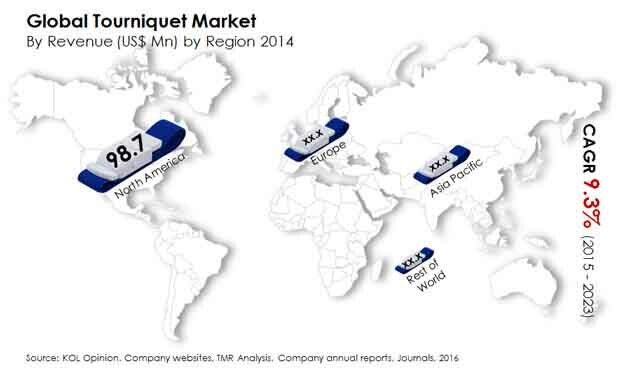 North America is the leading region in the global tourniquet market that accounts for over half the share in it. The increasing road accidents resulting in severe orthopedic injuries in the region has served to boost its market. In addition, constant efforts by the authorities to enhance awareness about usage of technologically superior tourniquet cuffs as an effective first line of treatment has also upped their uptake in healthcare facilities. Europe is considered the second-leading region in the global tourniquet market because of its superior emergency care infrastructure. Vis-à-vis growth rate, on the other hand, Asia Pacific is predicted to lead the market on the back of a burgeoning middle class population, soaring demand for technologically advanced trauma care products, and the foray of numerous medical device companies in the region. Some of the prominent companies operating in the global tourniquet market are Zimmer Biomet Holdings, Inc., Stryker Corporation, ulrich GmbH & Co, VBM Medizintechnik GmbH, Hammarplast Medical AB, Delfi Medical Innovation, Inc., and Pyng Medical Corporation.